When the Santa Barbara Symphony enjoyed a $23,000 hike in ticket sales by adding concert visuals were they leveraging twenty-first century technology or were they recreating a centuries old synaesthetic experience? Synesthesia occurs when stimulation of one sensory pathway leads to involuntary experiences in a second sensory pathway. The most common form of synesthesia is the neurological condition which causes words and numbers to be perceived in colour, but the condition can occur with any of the senses and in less dramatic forms. The subject is under-researched, but a mild form of synaesthesia may explain why visuals at a concert enhance the audience's perception of the music - for a simple illustration of the importance of sensory crosstalk try watching this video with the sound muted. Sound, sight, smell and movement can all contribute to synaesthetic experiences. Towards the end of his life Karlheinz Stockhausen reinvented mono-sensory classical music for a multi-sensory age using sound, movement, costume colours and aromas and in scene four of his posthumously premiered opera Sonntag seven different kinds of incense are released into the auditorium. 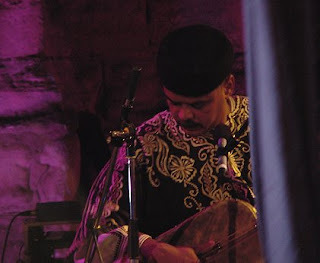 Ritual is an important component in Stockhausen's music and his son Markus has recorded an Electric Sufi album So there are links between Sonntag and one of the earliest synaesthetic rituals, the Moroccan Gnawa ceremony known as a lila. 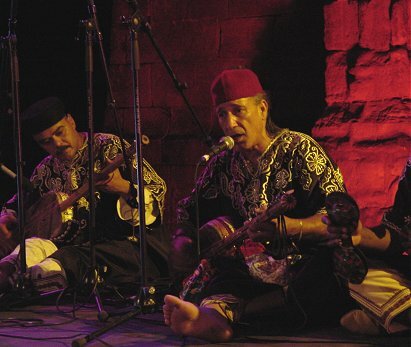 Gnawa music came to Morocco from sub-Saharan Africa with the slave trade and in a lila sound (gnawa music and song), sight (colours), smell (incense) and movement (dance) are used to create spirit-possession and healing environments. Lilas evolved from ancient African animistic and Islamic Sufi rituals into extended ceremonies which are still performed today and the twelve hour long Nights of the Seven Colours trance ritual is seen in the accompanying photos. This uses music, colours, incense and dance to celebrate the creation of the universe and in 2008 I presented a pioneering broadcast of the ‘black’ phase of the Seven Colours ritual on Future Radio. This was a collaboration with Kamar Studios in Marrakech and used their premiere recording of the traditional 'black' ritual - in gnawa symbolism black represents the unknowable, the ungraspable and, appropriately, the unheard. Given the widespread interest in North African trance music there is surprisingly little literature on the subject. Stephen Davis' fictionalised Jajouka Rolling Stone has already featured here and one of the few other books available is the valuable Traveling Spirit Masters: Moroccan Gnawa Trance and Music in the Global Marketplace by American academic Deborah Kapchan. This is a study of how traditional Moroccan trance music has become a major international market - which brings us full circle back to the Santa Barbara Symphony's synaesthetic box office bonus. 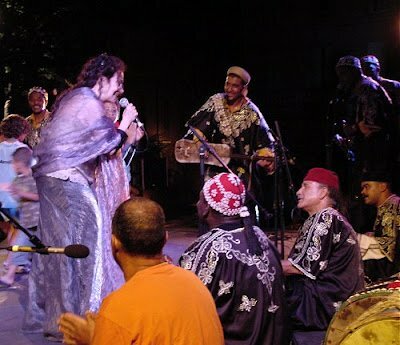 When a Gnawa talks about trancing, he/she's talking about getting out to a lila and letting a spirit (which the Gnawa can summon and then control) inhabit your body for awhile. When the record-and-concert-ticket-purchasing public talks about trancing, they are talking about getting out to a club and honing in on a primal state for a bit. There's just enough overlap in terminology here for the Gnawa to sell mad CDs of their syncretic African music... to the trancing public-at-large. 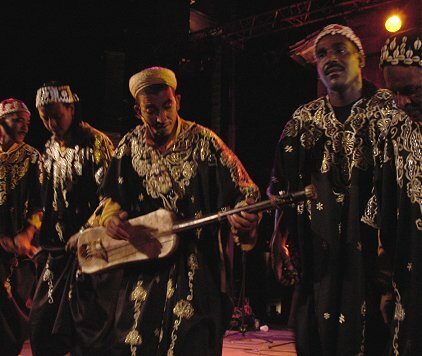 This is not lost on the Gnawa, who regularly alter their previously proscribed rituals to play them in Parisian amphitheaters for hard Euros so consumers can trance -- playing down the Islamic elements and punching up the African ones, shortening the songs, whatever makes them appear more accessibly exotic. Author posits that this might be a good trade: The global commercial class has money but no primal reality, the Gnawa deal in primal reality and need some bucks. If the lila is really about healing, then maybe it can heal better and more effectively if it changes to meet the needs of the folks willing to pay for healing. So we have the music but they have the money. The Gnawa compromised and adapted their sacred rituals so they could be played in Parisian amphitheaters for hard euros. So how, if at all, is classical music prepared to compromise? It really doesn't matter whether the Santa Barbara Symphony was leveraging twenty-first century technology or recreating a centuries old synaesthetic experience with its concert visuals. What does matter is that the orchestra hit pay dirt by meeting the needs of the folks willing to pay for healing. As both the Gnawa and the Santa Barbara Symphony have proved, creative compromise need not involve dumbing down. Some years ago I wrote how the 2400 seat Philharmonie Hall in Berlin sold out for a programme of Ockeghem's Missa Au Travail suis sung by the Tallis Scholars followed by Mahler's Ninth Symphony with the Deutsches Symphonie-Orchester conducted by Kent Nagano. So how about a synaesthetic BBC Prom opening with a lila performed by Abbès Larfaoui Baska and the Maâlem (Master Musicians) from Marrakech. In the second part would be another lila - synaesthesia sufferer Olivier Messiaen's mystical Turangalîla Symphony, with both performances enhanced by visuals from the creative team behind Aldeburgh's Faster Than Sound events? Now that really would exploit an $11 billion market opportunity. * This brainstorming post is one in an occasional series exploring the twilight zone of quantum entanglement that lies between science and art. I am convinced that the key to the future of classical music lies in this area which is inhabited by the unknowable, the ungraspable and the unheard, rather than in that other twilight zone inhabited by the avaricious PR consultants and duplicitous agents who generate the kind of hysterical nonsense about Gustavo Dudamel that recently appeared in Newsweek. More on music and quantum entanglement here and here.